Anshe Chesed (now Anshe Chesed Fairmount Temple) was founded as a German Orthodox congregation in 1841 and chartered on 28 Feb. 1842. It is the oldest existing Jewish congregation in Cleveland. It was formed after 30 members of the Israelitic Society of Cleveland, the city's first congregation, seceded in a dispute over religious ritual. Differences were overcome in 1845, and the groups merged under the name Israelitish Anshe Chesed Society of Cleveland. More on Encyclopedia of Cleveland History and Rabbi Moses Gries history of Jewish Cleveland. "As soon as resources permitted, the reunited Israelitic Anshe Chesed Society employed John Wigman, a master builder, to construct Cleveland's first synagogue building. 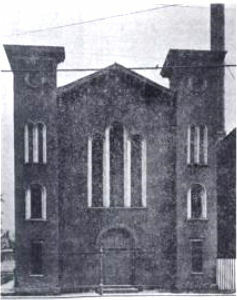 The Eagle Street Synagogue, a modified version of the local Baptist church, was erected on the south side of Eagle Street and dedicated August 7-8, 1846." The above quotation and the photo below are from Merging Traditions page 11. Anshe Chesed Society received a lot on Ohio Street (today Carnegie Avenue) which they exchanged for lot 38 on the south side of Eagle Street, between Erie Street (now East Ninth) and Woodland Avenue. There, in 1846, they built the city's first synagogue. The cost: $1,500. What would $1,500 buy in 1846? Here are two ways to estimate this. First, wages for a carpenter were then about $1.30 a day, roughly 1/250th of today's levels. Second, as recorded in congregation minutes of the early 1850's, member dues ranged from five to ten dollars a year. Thus our estimate is about $350,000 - $400,000 in today's economy. Buildings in 1846 were much simpler. There was no electricity, gas or central heating and no indoor plumbing. The sanctuary was designed for the traditional practice of separate seating of men and women. A ladies' gallery ran along three sides. Only two years later dissension would split the congregation again and lead to the formation of Tifereth Israel. Why was it so difficult to have only one congregation? In the early 1800's waves of change swept Central European Jewry as many rabbis and their congregations adjusted to modernity with new practices they called "Reform." These recent arrivals from Central Europe faced the same questions about Jewish law and tradition. Should they continue the custom of kashruth? Must a man cover his head when praying? Could men and women sit together in the synagogue? Would there be music in the service? And much more. Then add the question of language: should German or English be used in prayer books and in sermons? It is easy to understand the tensions that American Jewish congregations of the day needed to resolve. Those tensions would split some Cleveland synagogues in the 1880s and later, but they were not the reason for the Anshe Chesed being unable to remain intact. The most careful study of those early years of Jewish Cleveland is Dr Alan Peskin's 1973 monograph "This Tempting Freedom", which can now be read online. [ link to CSU's Cleveland Memory website ]. His conclusion is that the split was caused by "minhag". The first members from Unsleben Bavaria had brought over their worship customs from their small isolated town. Other members, from other Bavarian towns, had different practices. The Unsleben faction, in control, would not compromise. As a result, many of the others left. Students of management would say it was an unwillingness to share power. Anshe Chesed grew and in 1860 they enlarged the building. In 1887 they moved to a new building 18 blocks east, at Scovill Avenue and Henry (now East 25th) Street. See history of Fairmount Temple. In 1887 they sold the Eagle Street Synagogue building to B'nai Jeshurun for $15,000. B'nai Jeshurun would occupy it until 1906. See the B'nai Jeshurun history page. In 1927 the original building became a freight depot. See a picture. The vertical red line is Erie Street, now East Ninth Street. The synagogue is about 350 feet west of the center of East Ninth. of Progressive Field, home of the Cleveland Indians. The street running north-south is East Ninth. Eagle Street runs east-west, between the parking garage and ball field. 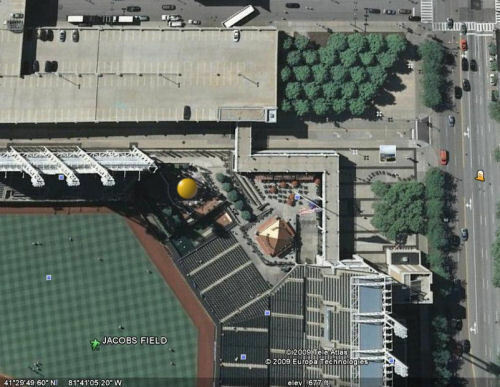 The gold circle on the above map shows what we first believed was the location of the Eagle Street Synagogue: near the circle of monuments that the Cleveland Indians built in 2007 and named Heritage Park. Then we received an email from Ned McFarland who told us that we had it wrong. After checking we realized that he was correct. What had we missed? When the Gateway area was redeveloped in the early 1990s, to provide more land on which to build the stadium, Eagle Street was moved north of where it had been for years. By measuring from the new Eagle Street, we were north of the true spot. An accurate "fix" would have to start by measuring from a point that had not moved, for example the intersection of Bolivar and East Ninth. Bottom line: the old Eagle Street Synagogue stood about 100 feet south of Heritage Park. 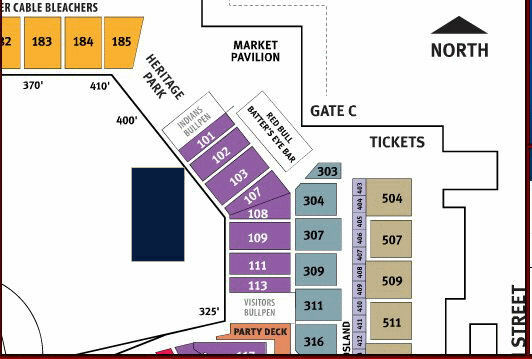 Using a copy of an image from the Indians website, we show it below as a black rectangle, roughly where it was in 1846.